Vinay Kumar is a thought leader in the field of leadership development and personal growth. He coaches leaders and teams within government agencies, private enterprises and non-profits. His primary focus is developing leaders who come from technical backgrounds. He also designs and delivers leadership education programs and workshops, as well as designs, facilitates and leads retreats and off sites. The majority of his clients are based in United States, Israel, United Kingdom and India. He strongly believes that as leaders grow from the inside out, so do those they lead. And that this in turn leads to greater collaboration, innovation, stronger engagement, retention and organizational performance. Vinay is the co-author of Language and the Pursuit of Leadership Excellence: How Extraordinary Leaders Build Relationships, Shape Culture and Drive Breakthrough Results (available in English and Spanish). His book is required reading in MBA programs and Leadership Development and Leadership Coaching Programs at major universities, federal agencies and corporations. They include Georgetown University, George Mason University, The College of William and Mary, Newfield Network, NASA, TEOCO Corporation and REI Systems. Rising from humble beginnings, his experience includes Fortune 100, federal government, small business and consulting. Vinay successfully spearheaded and led a privately-held business before becoming a leadership coach, author and speaker. Vinay has extensive experience with an array of roles including leadership, management, project manager, business development, marketing, client services, training, and operations. Vinay received his certificate in leadership coaching from Georgetown University and holds the distinguished Professional Certified Coach (PCC) credential from the International Coach Federation. He has completed extensive coursework and training in adult development theory as it applies to leadership coaching and he is certified in The Leadership Circle Profile 360, ESCI360, EQi 2.0, and EQ360. These assessments are used to support leaders become more effective. 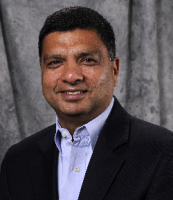 Vinay is a graduate of the University of Maryland-College Park, where in 1981 he earned a Bachelor’s of Science degree in Chemical Engineering. Vinay grew up in a multicultural family and today lives in Great Falls with his wife and 2 daughters. In his spare time, he frequently travels internationally, treks in the Himalayas, practices yoga, enjoys running, reading and going for long walks in nature In addition, Vinay continues to do his own inner work. He can be contacted at vinay@leadingforbreakthroughs.com.